Tart flavor lovers watch out because this blend is going to give you that spine tingling sour sensation that you have been lusting after in such an intense and impactful way. When you need that jolt of loud flavor to help kickstart your day by grabbing a hold of your senses, reaching for this juice is going to give you just what you need to be able to do that and make it seem so effortless. Who would have ever known that you could get such a bold flavor that still has a natural side to it that will have you feeling clean and pure. That is so difficult to be able to achieve so when you can get that from this juice that is fairly priced and easy to access, it is going to be like you have just come across your new holy grail vaping selection. Just forget about having to go to the grocery store and trying to find these exotic flavors in a ripe and delicious state because any produce lovers will completely understand the struggle that can come along with that. Just grab this luscious selection and hit the road because with this loaded into your tanks, your taste buds will be in very good hands. 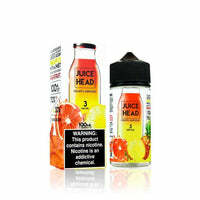 Juice Head E Liquid makes juices by vapers, for vapers so you know that you are going to be getting a product that hits all of the marks and makes sure that you get those little details that turn your whole vape session into something special. Pineapple Grapefruit starts all the way over in paradise with a blast of pineapple that will blow your hair back with just how expressive and sweet that it is, then some super sour grapefruit swoops in to keep us puckering.